Buffalo Trace™ bourbon adds aromatic, masculine appeal to this soap without off-putting boozy notes. Men's soaps can be tricky. Most either have him smelling like a 50s barbershop or a leather jacket worn by a musk ox. How about a scent that's smoky, slightly sweet, and all-American like...a fine bourbon? These Paul Bunyan-sized (10 oz.) bars are infused with real Kentucky bourbon from the Buffalo Trace™ distillery. No, it won't have him smelling like the morning after his bachelor party. The barrel-aged spirits provide just the right amount of aromatic appeal, without off-putting notes of alcohol. It also contains bits of ground corn, an homage to bourbon's recipe and also an exfoliant (that's dry skin removal, dudes). This set of three bars will last him longer than any old, spicy bottle of body wash—plenty of opportunities for him to close his eyes and dream of that magical land of whiskey rivers. Made in Wayzata, Minnesota, where we think the purifying waters of Lake Minnetonka would make an outstanding bourbon. These soaps are unique and have a delightful scent! My brother-in-law was excited to receive these soaps! This gift was the perfect solution for the VERY hard to buy for person. This arrived at my office and took it around to my female co-workers to smell. They all raved about it and want to purchase for their significant others. It does have a "aromatic, masculine appeal"
My father has Alzheimer's. He used to work in a bottling house at a bourbon distillery. I thought this soap would bring back pleasant memories since it has Buffalo Trace Bourbon. It does not have a bourbon scent. The scent is very pleasant, just not bourbon. My wife got me this soap out of the blue, and I loved it from day one. It lathers up into a great wash in the shower and lasts for a really long time. 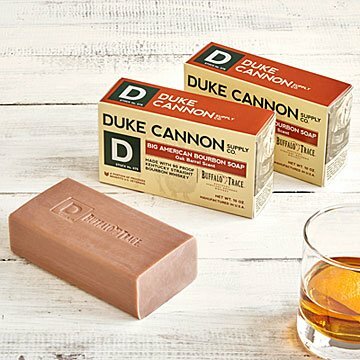 I'll definitely be trying out other types of soap from Duke Cannon. This soap definitely doesn't make you smell like you just fell off a bar stool, but has a great woodsy smell. I bought it for my boyfriend and he refuses to use any other soap now. He's hooked! The smell lasts for a while and always makes your bathroom smell super good (along with the person using it). The best part is that it''s 3x larger than any soap you can purchase when you make your weekly target run, so this pack will last you MONTHS! Well worth the price!